On a recent visit to Puerto Rico, I realized just how much narrative has to do with the challenges the island faces and its response to those. Though it is a fertile land and has a highly educated population and a vibrant, resourceful culture, Puerto Rico is poorer than Mississippi, the poorest US state. Loíza, the blackest municipality in Puerto Rico, is the poorest on the island. A newly forming nonprofit, Caribbean Cultural Corridor, a network of local economies for local Black art, seeks to challenge anti-black narratives on the island, starting in Loíza. Tatyana Hopkins describes the town in Black Voice News. Known as the “Capital of Traditions,” Loíza is the birthplace of Black Puerto Rican music and is where the dance Plena was born. Bomba music and other African-Taíno infused food and traditions are commonplace here. Loíza artisans produce the colorful coconut masks displayed at festivals and make the unique Bomba drums. It began as a place to harbor escaped slaves from Puerto Rico and all over the Caribbean. But, despite its rich culture, Loíza is one of the most impoverished parts of Puerto Rico. Only 20 minutes east of the capital San Juan, Loíza is often overlooked as a tourist destination, even though resorts lie 5–10 minutes east of the river in Rio Grande. The tensions were evident within the group. Very clearly and early on, the differences between the mostly black leaders were named. These include differences of class, education level, and geography. They reveal the fractal nature of oppression, where the patterns are similar across scale. For example, during the lunch that followed, a small group of women from Tocones, one of the poorest neighborhoods in Loíza, wanted to tell me their story of their marginalization within Loíza. They didn’t feel comfortable sharing it explicitly within the larger group. This little yellow “store” is hard to miss—it is decorated inside and out with beautiful coconut Vejigante masks. Vejigante are traditional figures used in the local celebrations (namely, the annual Saint James Festival in July). They are elaborately dressed with brilliantly-colored costumes, and scary-looking carved coconut shell masks, with long pointy horns. Raul Ayala, with help of the rest of the family, continues the legacy of coconut mask carving that the Ayalas are known for. The family also is famous for their local Bomba music and dance (Ballet Folklórico Hermanos Ayala). I was surprised at how reasonably priced the masks were. You can get a hand-carved half mask for about $30, and the whole masks start at about $75 and go up (depending on how elaborate they are). Each mask is hand-carved and painted, and signed by the artist. In addition to their masks, they also have a few other types of handcrafted souvenirs. Through this website, one can find the family’s Facebook page, which posts pictures and otherwise showcases events but doesn’t tell you much about who they are or the cultural role they play. Also featured is Samuel Lind Studios, the live-and-work space of a very well-known painter and sculptor. He is also an Ayala through maternal lineage; these families have influenced each other artistically and are known as stewards of local African history, wisdom, and aesthetics. It is easy to spend a day with Samuel listening to his passionate stories about the great singers who visit him to learn about this heritage and weave it into now-famous songs, like Héctor Lavoe, or the indigenous and relatively unknown people who still live in the mangrove in Loíza. It’s as if no one told these families that blackness is looked down upon, and that’s all for the best. I have always experienced them as loving, humble, and noble, and consider myself blessed to have grown up in such a family where anti-blackness was not present. Just a couple 100 yards away, down the small side street to the north, you will find Samuel Lind Studio. This 2-story wooden house is beautifully covered with flowering plants, and is home to Samuel Lind’s working studio and art gallery. As you walk inside, you are almost overwhelmed by the colors and beauty of the art. His work is mainly inspired by his life in Loíza, its nature, people, beauty and heritage. If you have been to the Botanical Garden in Caguas, you have already seen one piece of Lind’s work—he made the huge bronze sculpture displayed in the African section of the garden. Most of the works in his studio/gallery are for sale, and range in price to very reasonable for lithographs/posters up to big bucks for original paintings and bronze sculptures. Lind also doesn’t have a website, but, like the Ayalas, he has a Facebook page where he posts his work and describes his approach and inspiration. An online search for things to do in Loíza quickly reveals other destinations. The Hacienda Campo Rico Heritage Tour takes the visitor to a former sugar cane plantation. Piñones, Puerto Rico’s largest mangrove forest, is near Loíza Beach, which is lined with Afro-Caribbean food kiosks. The Maria de La Cruz Cave, “an enormous formation of limestone origin, whose measurements are 164 feet wide, 82 deep and 98 high, is one of the 72 archaeological sites documented in Loíza, according to the State Office of Historic Conservation.” Ricardo E. Algeria, a Puerto Rican anthropologist and archaeologist known as “father of modern Puerto Rican archeology, excavated the cave to great fanfare. “Beneath the surface of the cave, Alegría excavated polished stone tools, some small flakes carved from flint, pieces of red ocher, an abundance of food remains, mostly marine and terrestrial mollusks, as well as crab levers. He also recovered a human burial in an extended position. Alegría baptized the culture representative of these remains as the Archaic Culture, because it is the oldest indigenous culture found in Puerto Rico,” said archaeologist Miguel Rodríguez López, rector of the Center for Advanced Studies of Puerto Rico and the Caribbean (CEA), to EL VOCERO. Yale published a book by Alegria on the excavations. 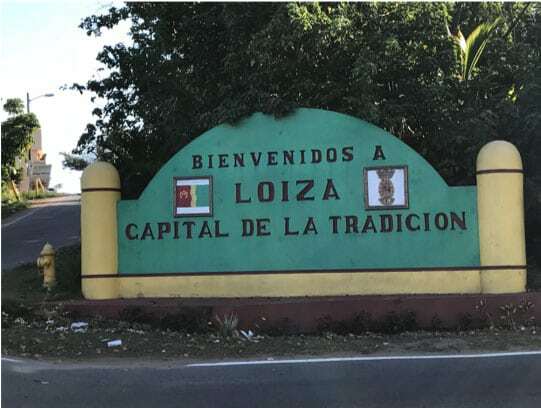 As these anecdotes and descriptions demonstrate, there is already a sense of the historical and cultural richness of Loíza, but its creators and stewards don’t benefit economically from it. The Corridor seeks to better organize these artists and stewards and link them to one another to help build a more viable and equitable local economy. It will build on the work of COPI [La Corporación Piñones Se Integra, or Piñones Integration Corp.], which focuses on cultural and ecotourism, by providing workshops on conscious tourism, as opposed to exploitative tourism. Dr. Marta Moreno Vega is the visionary behind the Caribbean Cultural Corridor. New York born and raised, she found her way back to the island early on and has spent the last four decades connecting to local black artists and thinkers and promoting their work. She has already identified the building she intends to purchase for the project—a beautiful, abandoned, two-floor structure that sits high on a perch. It is available through foreclosure and needs repair, but it is easy to imagine it as the center of a Caribbean-wide cultural network, as Moreno Vega and her collaborators do. The Corridor is also an example of new approaches by stateside nonprofits like the Association of Black Foundation Executives (ABFE), which is expanding its work to the black diaspora. ABFE partnered with the Community Foundation of Puerto Rico (Fundación Comunitaria de Puerto Rico), which is leading the philanthropic work on equity on the island and exploring how to support more explicitly its racial aspects, to host this gathering to build awareness of, solicit feedback for, and build support for the Corridor. The response was a resounding yes. A few days later, the collaboration leaders met at the Community Foundation of Puerto Rico to debrief the gathering and accompanying activities and identify possible solutions. We were sharing about the things we have in common after the hurricanes. The similarities are a lot. Some women in New Orleans were talking about their experiences of leaving to other cities, where they were called refugees. And they said, “We’re on our land.” And when they went back [to New Orleans], they didn’t have the same structures. Things were different…the privatization of the schools. Now the teachers weren’t black. They came from other places and didn’t know the cultures of the community. The same thing is happening in Puerto Rico. In Piñones and Loíza, when Maria came, the department of education closed the schools immediately. We’ve known that they want to close the schools for a long time now; the excuse for the government was Maria. Perhaps one major cause of the violence in Loíza is the high unemployment rate. Though a report by the Commonwealth of Puerto Rico, Department of Labor and Human Resources, Bureau of Labor Statistics for 2015-2016 lists unemployment in Loíza at 11.4 percent, this was before Hurricane Maria. Local municipal legislator Denisse Lanzo Cortijo, who was present at the gathering, said the numbers are closer to 70 percent. So, since the storm, most people in Loíza are unemployed. As the group turned to solutions, it quickly became clear that Puerto Rico does not track race rigorously. In fact, people self-identify their race and many choose to whiten their identity. In the 2010 Census, 12.4 percent of the population identified as Black and 75.8 percent as white. Mary Ann Gabino, Senior Vice President at the Community Foundation, proposed academic scholarships to support the study of data on racial equity, which would help identify gaps and generate solutions. There’s so much talent in Loíza and no one is paying attention to it. In lifting that, we should train people so they can become entrepreneurs. We always see ourselves as limited. We have young people doing music speaking through the narrative. Training young people in the narrative of culture and empowerment is powerful. Art flourishes in Puerto Rico, and there are already groups like Colectivo Morivivi, a collective of young women artists that has gained recognition for their murals, which aim to sensitize the viewer to the human condition. Much of its work features black Puerto Rican women. There is a lot to build on, connect, and amplify.